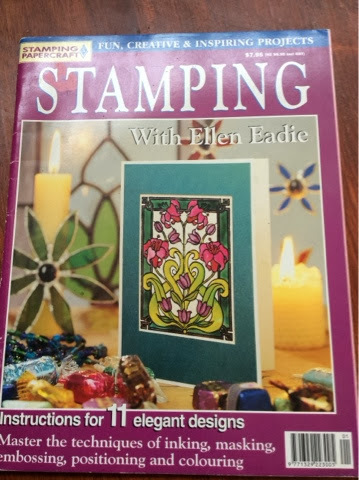 Well, look what turned up today... Ellen's stamping book, published in magazine format. This dates back to the very earliest days of the magazine "Stamping and Papercraft". 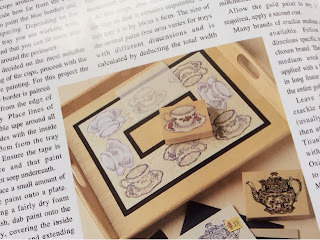 In it, we find a pretty project involving a tea cup stamp. That stamp is in my sale right now! And I don't mean another stamp of that design, I mean the actual one in the picture! Here's the link - it's currently selling for a positively embarrassing $1. Incidentally, that tea pot stamp in the photo is not in the sale any more. That went to a good home ages ago!